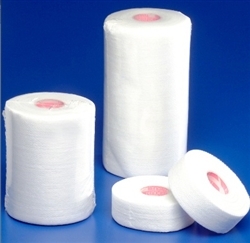 Kendall™ Tenderfix Hypoallergenic Cloth Tape has a gentle adhesive and a soft non-woven backing for taping catheters, IV tubing, and dressings where conformability is needed. Tenderfix Tape is a soft woven cloth tape. It provides strong, flexible securement, yet is soft and gentle for patient comfort. The adhesive formula is hypoallergenic and is gentle while providing good adhesion.